If you're of the type that believes the 'Fantasy' genre must strictly remain within the realm of medieval drama, or swords & sorcery, this book might not be for you. It's deep within 'Alternate History' or 'Historical Fiction', but it's not without its own speculations. It may even be 'Military Fantasy'. Regardless, what drew me to Clash of Eagles was its premise of a Roman empire that doesn't end and its first encounters with Native American societies, and it turns out to be a pretty good read. 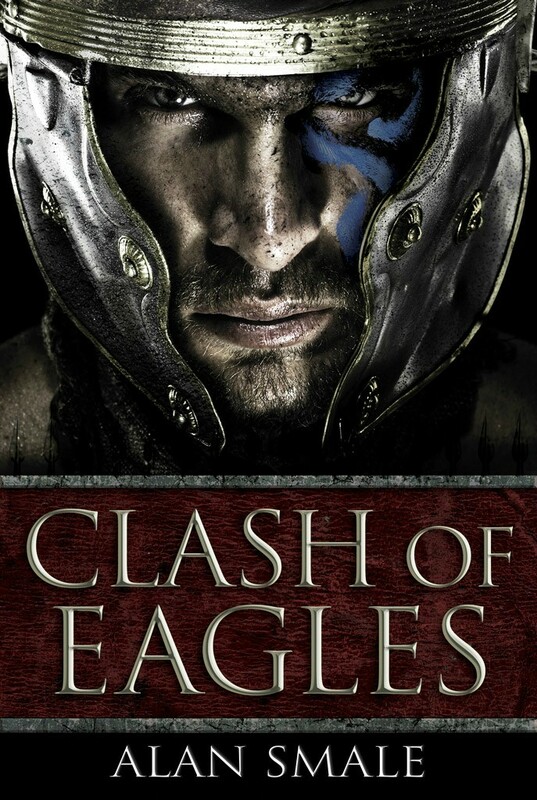 In Clash of Eagles, the story follows Gaius Publius Marcellinus, Roman Praetor, as he leads the 33rd Fighting Legion deep into Nova Hesperia (known to us as North America) where he searches for cities of gold, or anything else of worth to Roma. Marcillenus and his legion carve a bloody path deep into Nova Hesperia, but they reach the city of Cahokia low on supplies. The Cahokians, however, are not unprepared to welcome the legion with arms and weapons unseen by any Roman, and Marcellinus's legion is wiped out. He is spared from the slaughter, but then must cope as the only Roman in Nova Hesperia, literally surrounded by a foreign people and culture. Since Roman and Cahokian societies are not complete unknowns, the novel wisely draws on history for details like how a Roman legion marches across a continent, and how Cahokians lived. Being a fictional encounter, some bits and pieces are obviously extrapolated from history books, but Smale provides appendices on Cahokian society, Roman military operations and terms, and further reading on both subjects. This background really makes the story feel right. The Romans are expansionists, and Nova Hesperia is just another land to be subjugated and conquered. Even after his defeat, Marcellinus considers how Cahokia will serve Roma when the next legion arrives. However, the Cahokians are not simple savages as Marcellinus believes at the start, and their seemingly disorganized response handily trumps his legion without much contest. Marcellinus is an interesting character. Early on, he's portrayed as a tough, but pragmatic leader. After his defeat and rehabilitation, the toughness must necessarily fall away but he remains pragmatic. Smale excellently portrays him as a fish out of water, but still trying to swim. The question of his loyalties comes up often and it's dealt with in a realistic manner. His internal conflicts are convincing as he must face how he got to where he is, and what he intends on doing now that he's there. The Cahokians are likewise well portrayed. Early on, their motives are fairly inscrutable. Marcellinus can't necessarily communicate with them, and I was also left wondering why they would keep him alive. As the story progresses, the communication barriers are lowered and different forms of cooperation begin. If it seems like I'm glossing over some of the Cahokian's names, its because some of the twists in the story involve the roles of the characters. While Marcellinus is the clear leader of the invading Roman army, Cahokian society is more complex and the power struggle between Cahokians and their captive is part of the plot. Being a story about the invasion of Romans on North American territories, Clash of Eagles is full of conflict. Again, the historical references to what is known about how Roman military operation and Cahokian society give the battles a feeling of authenticity. There are speculative elements in some of the Native American weaponry, but it's all fairly restrained. The descriptions of the battles are clear and well-written. They are simultaneously chaotic but not impossible to follow since the perspective is largely focused on Marcellinus and what happens around him. If there were one thing I would change about the story it is that it ends rather abruptly and without a clear resolution. Between the Iroqua and the potential return of the Romans, the Cahokians have no lack of enemies and none of them are completely resolved. However, I am willing to forgive this open-ended conclusion as this book is the first of a trilogy. Still, I didn't feel the brakes until I noticed that I was approaching the last 20 pages, and it felt like there was enough momentum to go for another 50. Clash of Eagles excellently weaves a story of two cultures colliding with a respect to historical background. Perhaps I am a bit biased as I live close enough to the Cahokia region that I've visited their ancient mounds, but Clash of Eagles is an excellent start to this trilogy and I want more.